The gas cell is for analysis of pure gases or gas mixture in which component gases are present at concertration of 5% or more. The gas cell has a fixed path length. The window of the cell are easy remove for clening making the cell ideal for working with reactive gases. The cell comes completely assembled in SS Universal mount. It inclued glass body, rubber or vition gaskets. Gas cell offers the spectroscopist a relatively inexpensive method for infrared gas studies. The path length is 10 cms and 5 cms with plain tubular endings and Valve are supplied as standard. Cell is similar to Type A expect that it is available in 5cms. & 10cms.and can be used at increased or decreased pressure and filled with gas tight syringe. 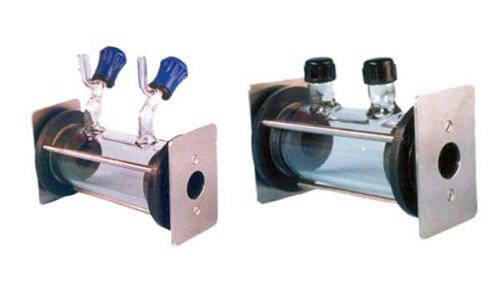 The sample is introduced through septa which are fitted to inlet & outlet parts.